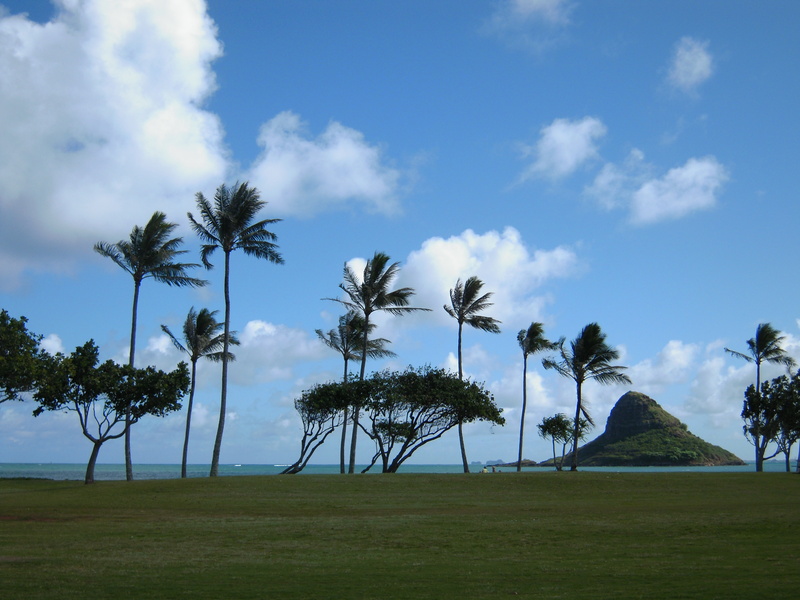 Aloha all – here is Part 3 of my Hawaiian photo blog. 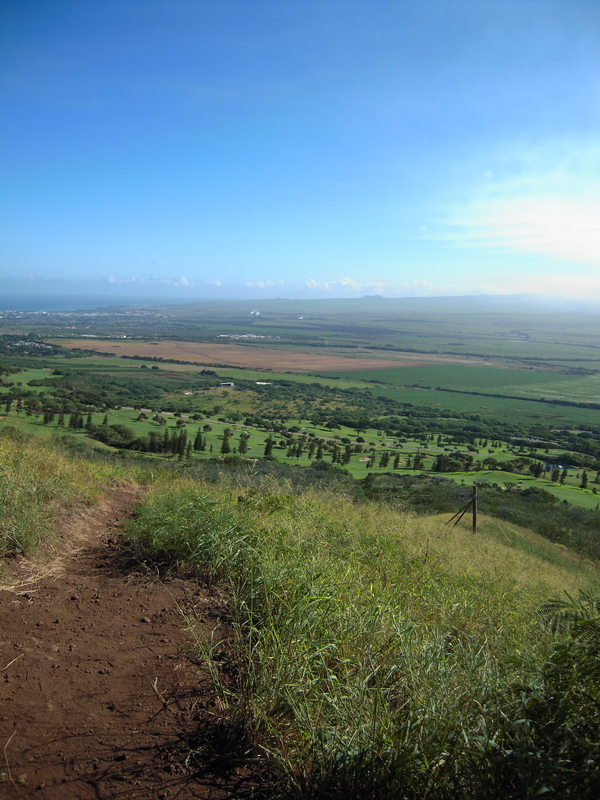 These photos were all taken on the beautiful island of Maui. My family has been staying in Kihei in South Maui for decades. Though it has changed dramatically in that time, it still is pretty laid back and the views are wonderful. 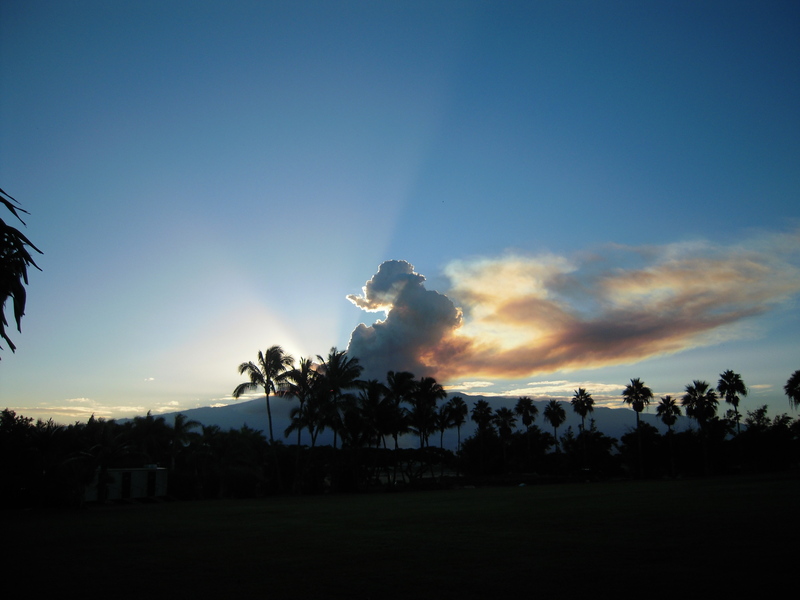 This photo was taken while on a morning walk on South Kihei Road. This photo of the last itty bitty bit of sunset was taken in the car – yup, I’m one of those people hanging out a car window with a camera . . . or two. I love that the lens focused on the horizon and everything else is nicely blurred. I also love that the orange just about matches the color of the rental car we had (mix-up at the rental agency awarded us an upgrade to a sports car with a rather loud bright orange paint scheme. 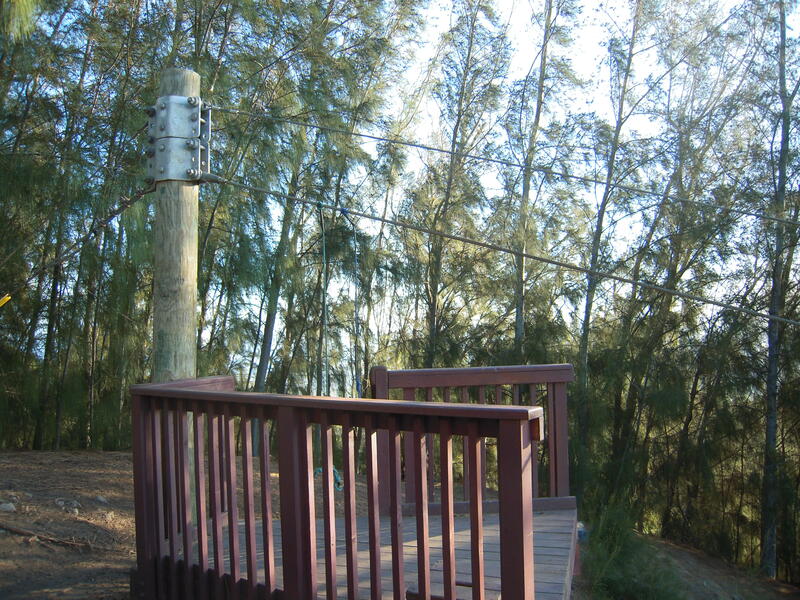 We affectionately called it “The Monarch” after the Monarch butterflies found on Hawaii). Sigh, I miss that car. 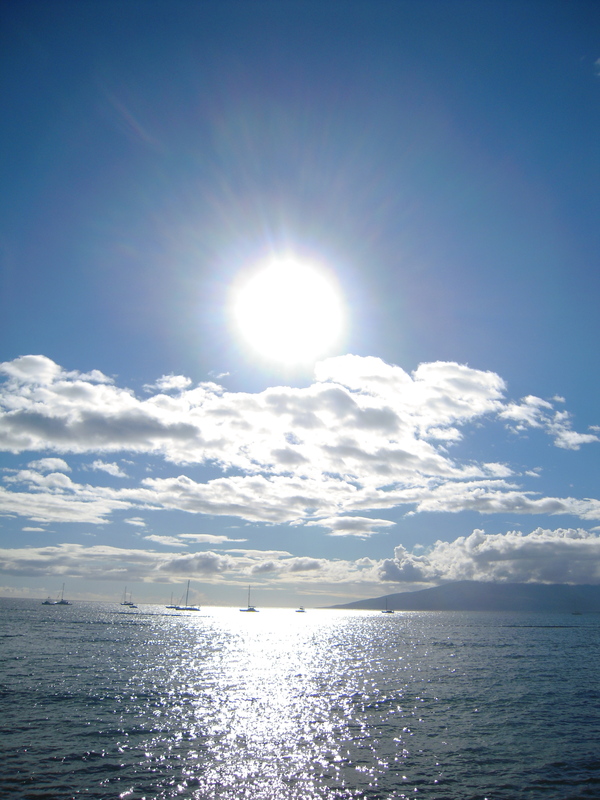 We hopped over to Lahaina one day since I had to do some last minute shopping for Christmas. Doesn’t everyone need a box of cookies from Honolulu Cookie Company? We strolled Front Street and I snapped this photo of the sailboats on the water. 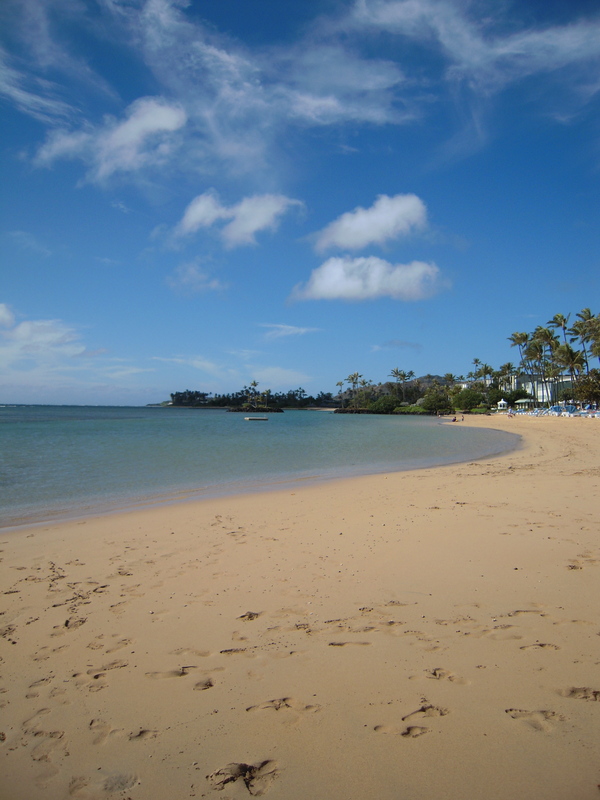 Taking a drive along the northern part of the island, we ended up at Honalua Bay. There was a single sailboat in the bay and you can even hike down to the beach for some lounging and swimming. 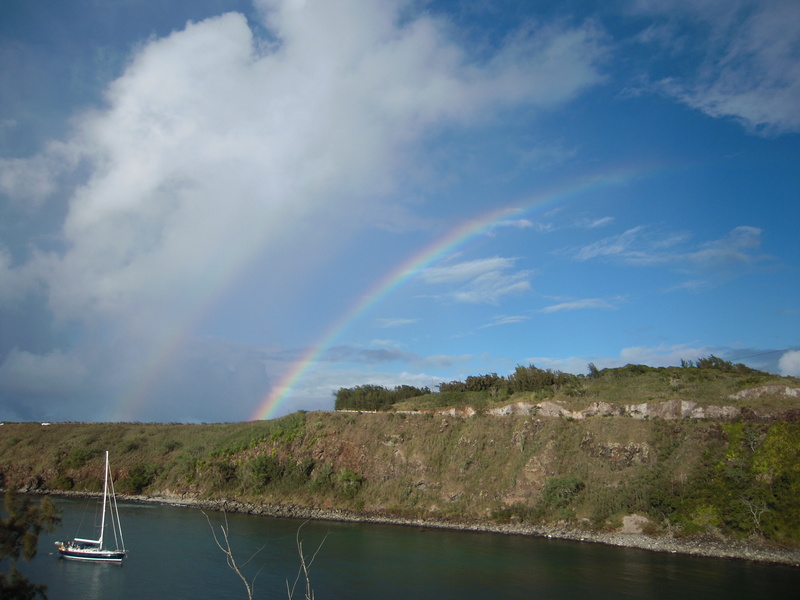 I took several photos of the bay and the single rainbow. A few minutes later the second rainbow on the left started to appear. We often wondered if these fields with the flowered tops were sugar cane and during our ziplining expedition, our guides did confirm they were sugar cane fields. The flowered tops meant the fields were already past the harvesting time. I took this photo from my vantage point in the Monarch and loved the lighting at sunset. 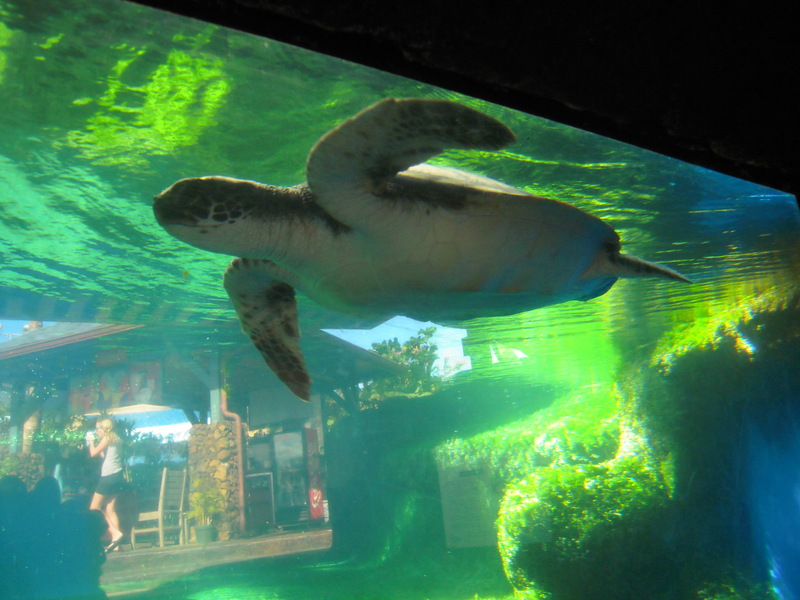 We visited the Maui Ocean Center which is a fabulous aquarium on Ma’alaea Harbor. 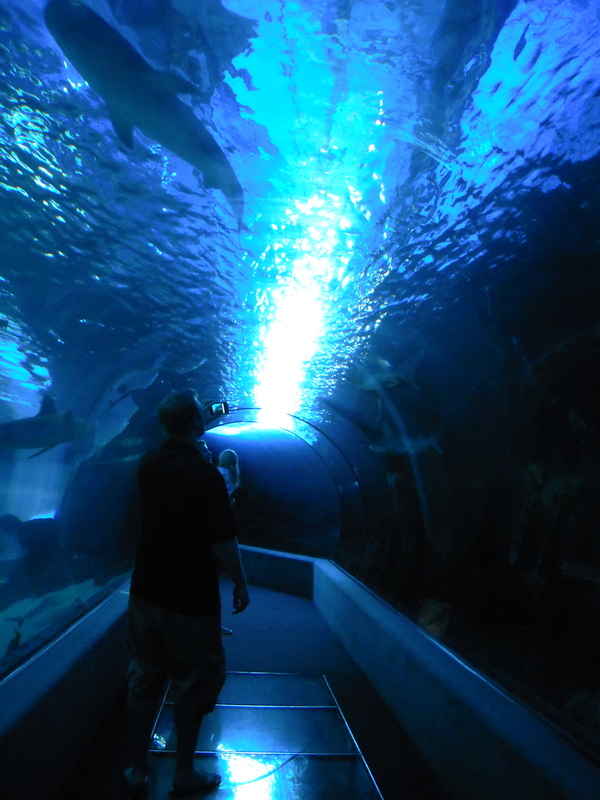 They have a wonderful collection of sea life and beautiful views from the outside exhibits. OH – I also updated my storefront, so some of these photos are now available at Society6. Enjoy! 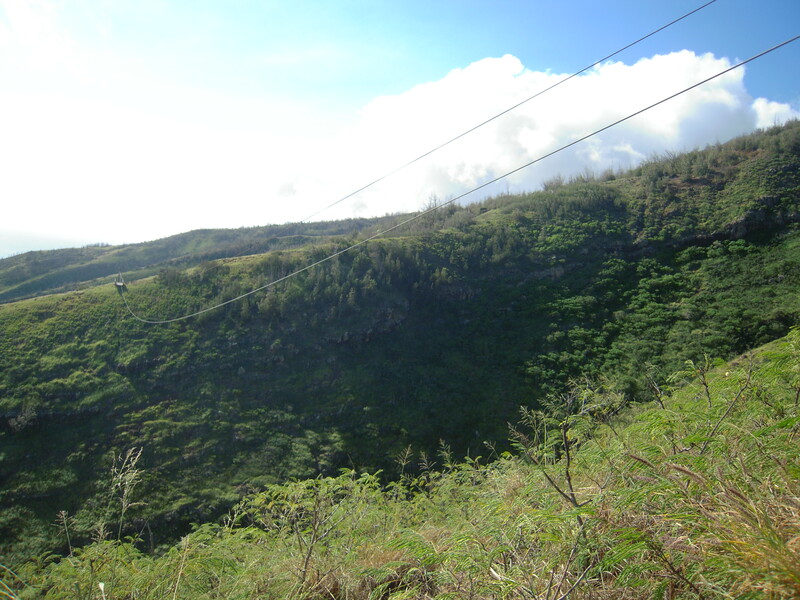 Here are more photos from our recent trip to Hawaii from the beautiful island of Maui and the amazing time we had ziplining. I’ve always wanted to go ziplining and luckily my adventurous hubby, brother and sis-in-law were game too! 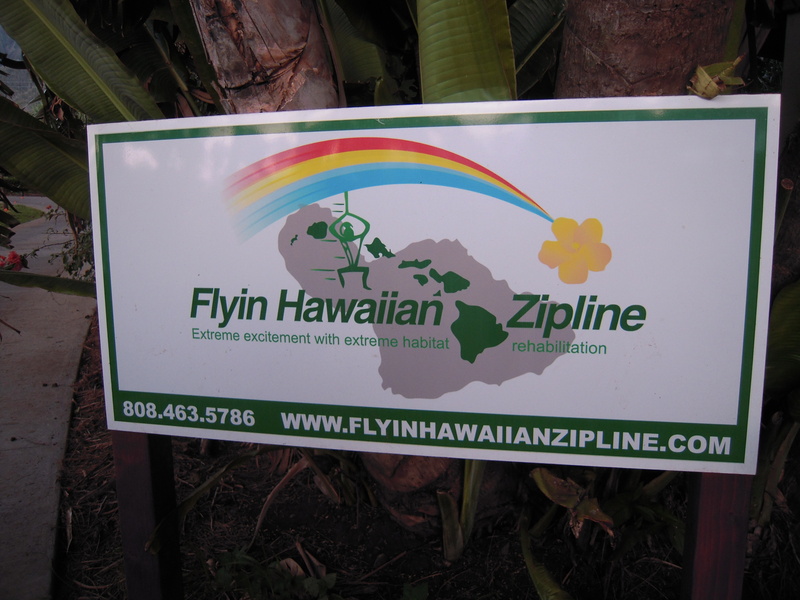 After doing some research online, we found Flyin Hawaiian Zipline. 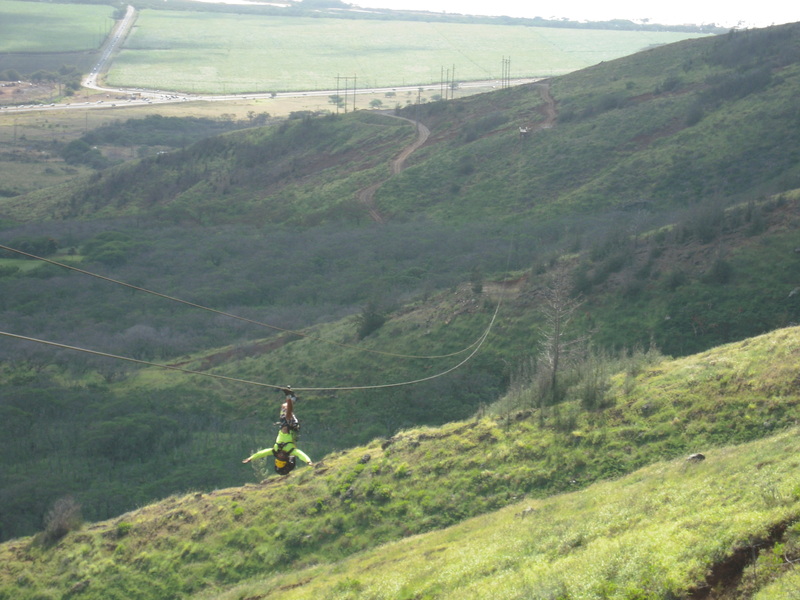 They had the longest zipline in Hawaii with a 4-5 hour tour! I am not afraid of heights, but like any unknown event, I get some butterflies in my tummy at first. 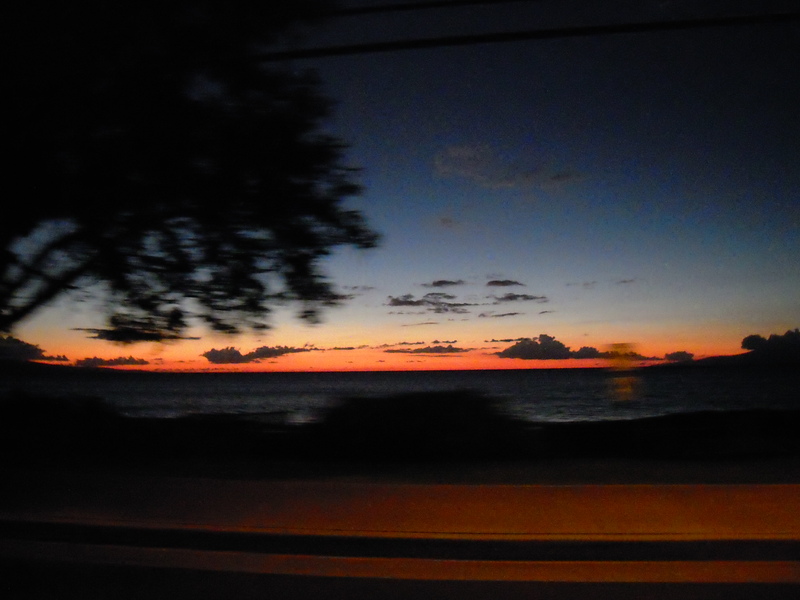 We awoke before sunrise and traveled to Wailuku to the Maui Tropical Plantation where the 7am tour started. 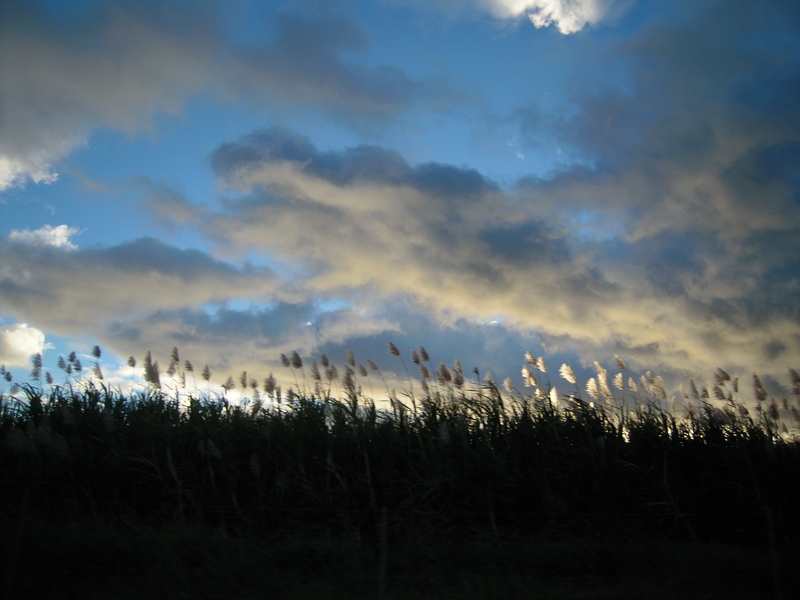 One of the sugar cane fields was being harvested so we saw the smoke from the harvest during the morning sunrise. After weighing/checking in our guide, Alika, got us harnessed up. 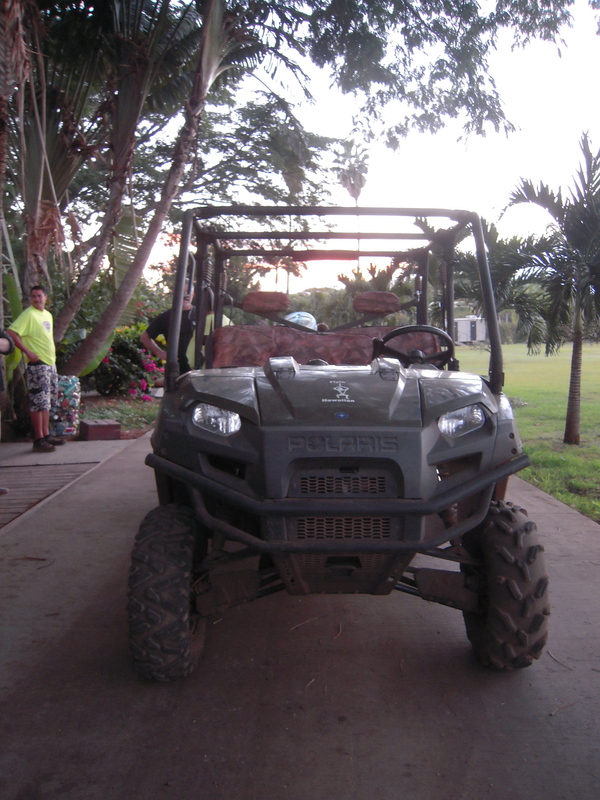 One of drivers, Caleb, took us up the mountain in one of these ATV’s. 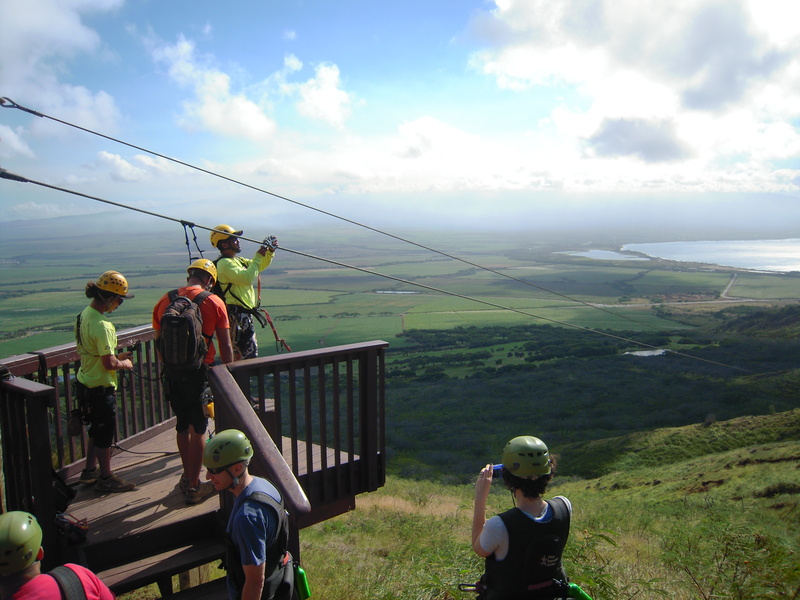 Our other two guides, Nick and Kupono, took us through the safety protocols, braking methods and we did our practice zip that was only a few feet off the ground. Then the fun began. They start you with the 2nd longest line and I just had to go first. . . you know, to chase the butterflies away. Here are some views from the mountain. The hikes were quite manageable and the guides always offered their help, snacks or water. This gives you an idea of what the lines look like from ridge to ridge. This was one of the smaller lines. In the middle of the tour our guides took us to a garden where FHZ is making an effort to bring back native plants to the islands. 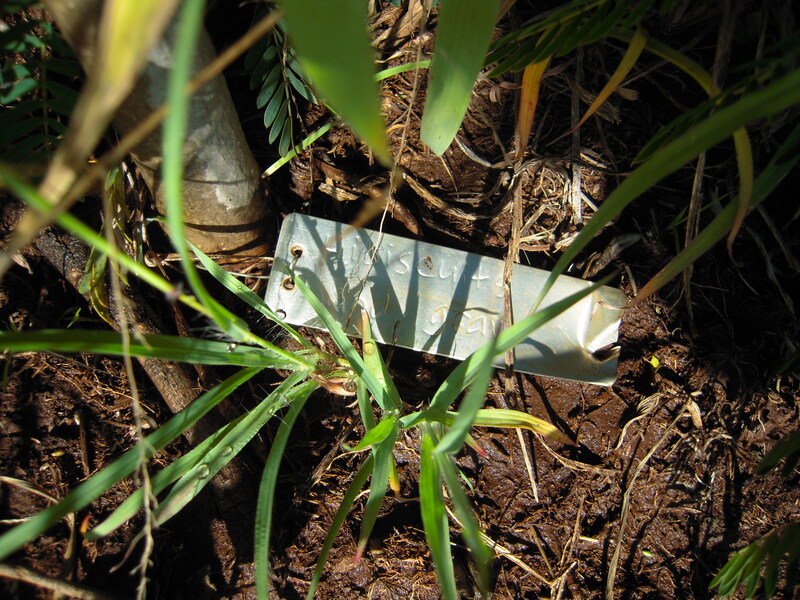 They are planting the Hawaiian State Flower, the yellow hibiscus, on the mountain and had us help water them. The first plant I watered was called “Hibiscuits and Gravy” – awesome. Our guides took turns going to the next platform, and that first person over was who helped us ‘brake’. Alika is getting ready to head out. Here is Alika’s way of heading to the last platform. That little speck on the far ridge was where he was heading. No, we didn’t get to go upside down, but we did go backwards once! And here’s me coming in for a landing. 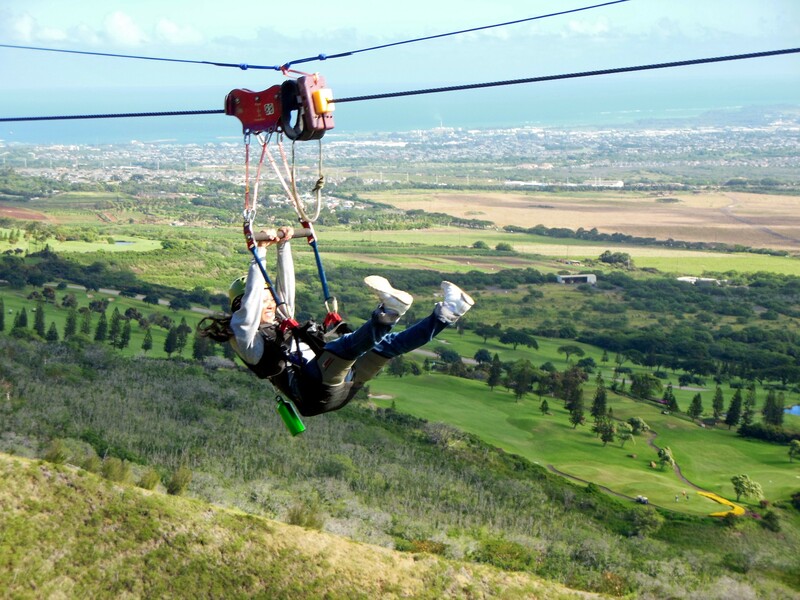 I can’t think of a better way to ring in the Winter Solstice than ziplining Flyin Hawaiian on my favorite island with my hubby and siblings. Photo by Hermine. 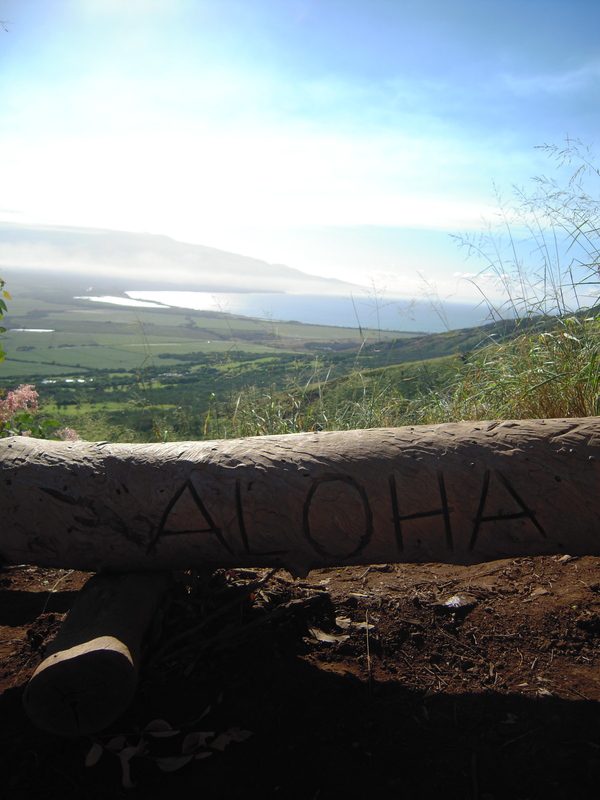 Aloha and Hau’oli Hakahiki Hou! Happy 2014! 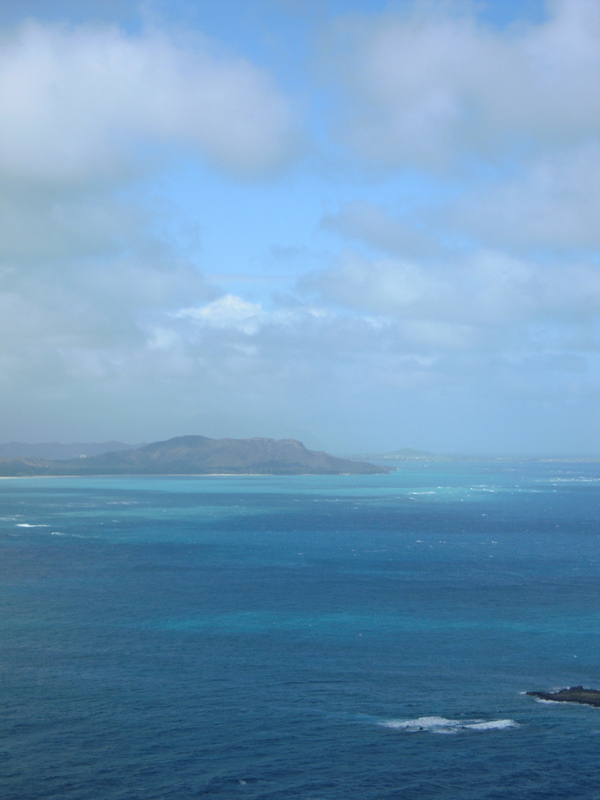 We had a nice Christmas holiday back ‘home’ in Hawaii and already miss the islands. After going through my photos, I thought I’d share some of my favorites. 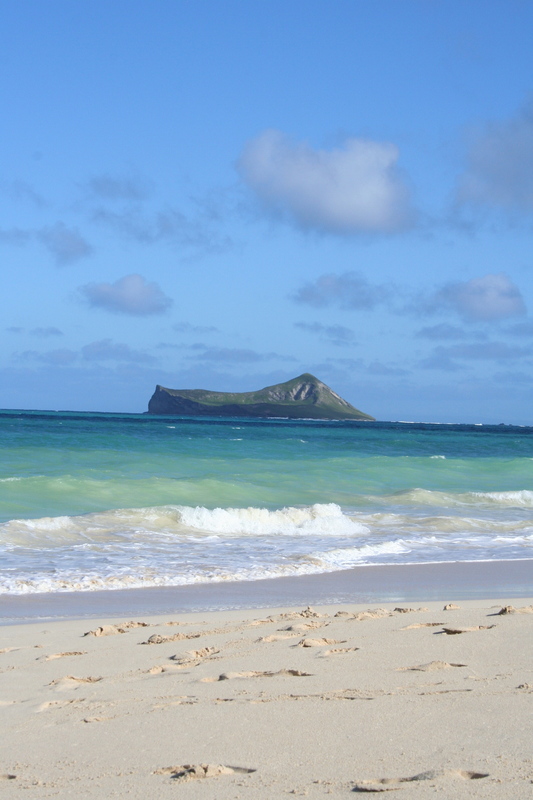 On the island of Oahu, we visited our favorite beach, Waimanalo. It was a beautiful day though there were red flag warnings for Man-Of-War jellyfish in the water – hubby even spotted a baby one on the shore – so we stayed on the sand. 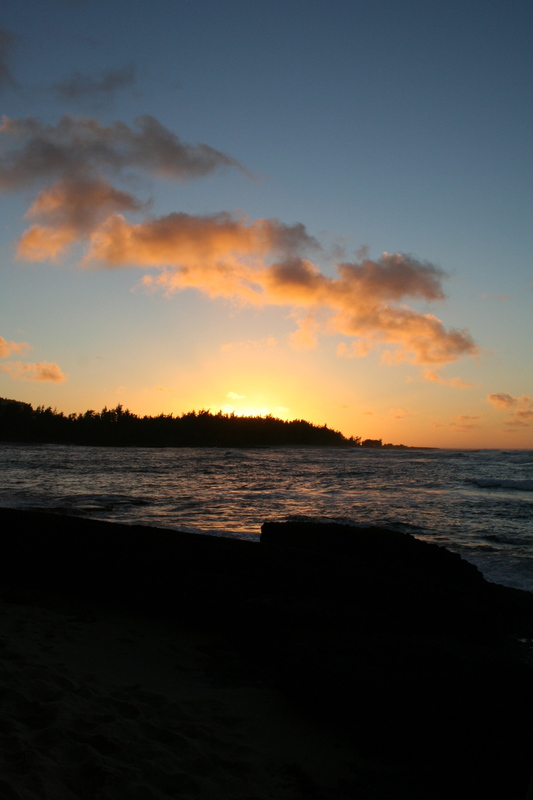 We stayed on the famous North Shore where the sunsets were just spectacular. Here is what it looked like on the first night. This rainbow came out early in the morning so I hurried to snap many photos before it disappeared. We had lunch twice at Ola’s where the view was stunning and the food was delicious. I tried the fish called hebi (shortbill spearfish) for the first time. Yummers. We loved being back home, but eventually it was time to leave. So, we boarded a hopper flight (aka propeller plane) over to our next destination. 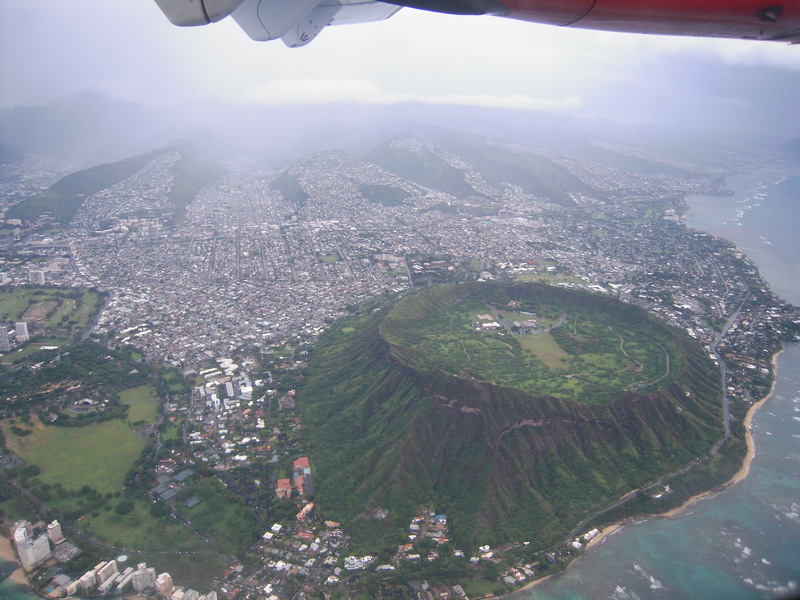 On the way I took this aerial view of Waikiki . 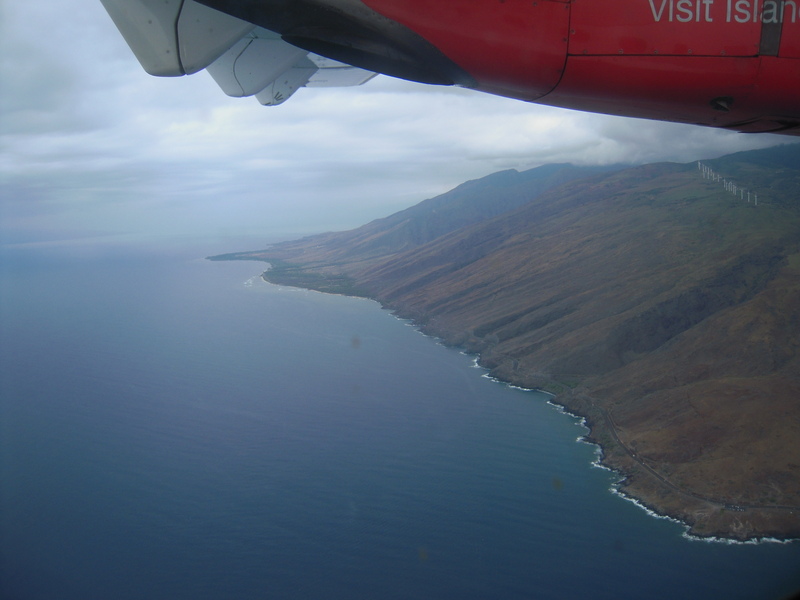 . .
35 minutes later, we touched down on my favorite island of Maui. One of the things I like to do before I go on a trip is to check out FoodNetwork.com and see if there are any ‘famous’ places to check out. Of course there are the Zagat rated places but we love visiting Mom-n-Pop shops that have tons of character and history. 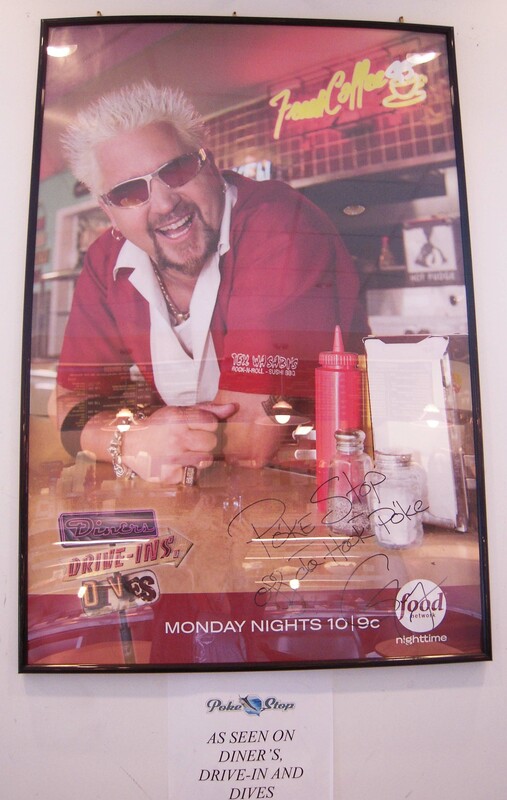 When chef Guy Fieri finally visited the islands for his show, Diners, Drive-In’s and Dives, I recorded the program and mapped out each place so we can go there on our next trip. We were able to visit 2 of the places he went to (one more than once!) and was so glad we did. Here are Ono Grindz (good food) from Oahu – some famous, some not-so-famous, but all very very delicious. Our first stop whenever we land is GORDON BIERSCH BREWERY @ Aloha Tower. Yes, they do have GB’s on the mainland, but they don’t always have the same things. 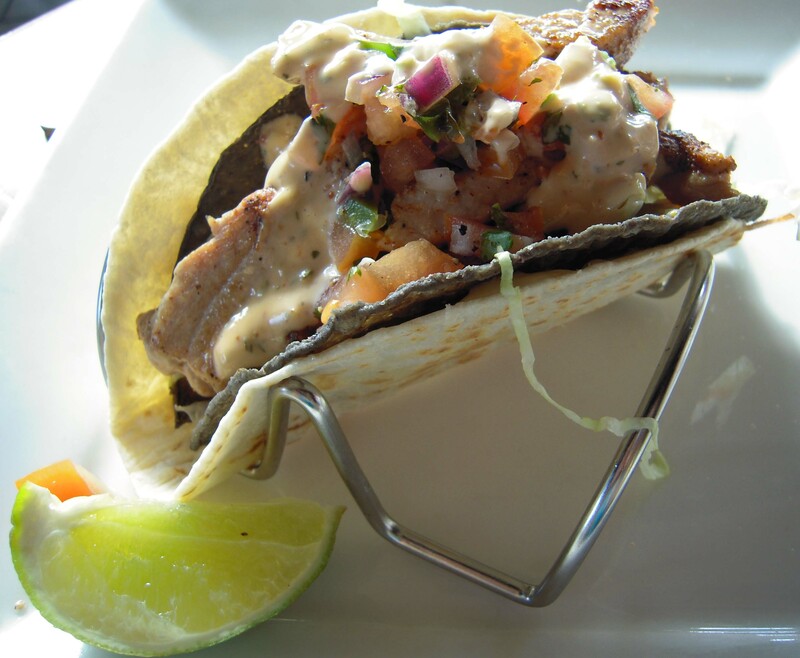 Our favorites are the Ahi Poke and a new dish, the Cajun Ahi Taco, crispy and soft with a great sauce on top. 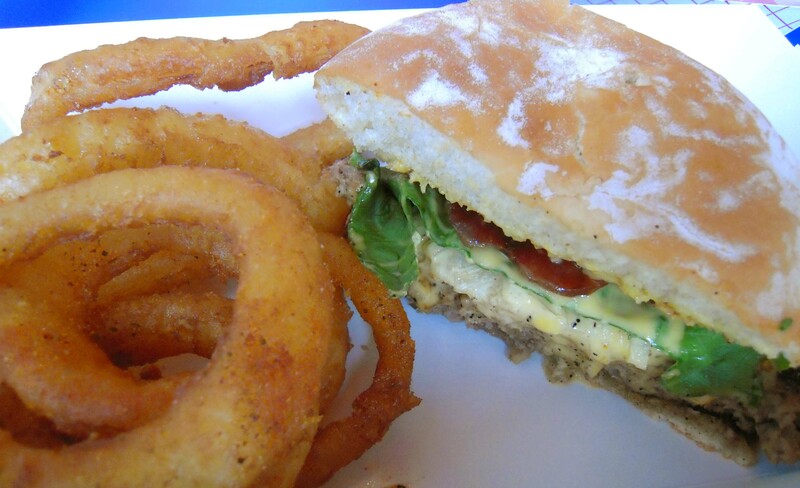 If you’re craving a hamburger, our favorite is TEDDY’S BIGGER BURGERS. These burgers are served with Teddy’s sauce which is sort of like Thousand Island, but not quite. And their onion rings are killer. They have a number of locations on Oahu and Maui, but started branching out to the Mainland and even one in Japan. We visit Teddy’s quite often . . .
Keeping with the ‘handheld’ theme, this next place was one that Guy Fieri visited. The POKE STOP has two locations on Oahu and we visited the Mililani store. 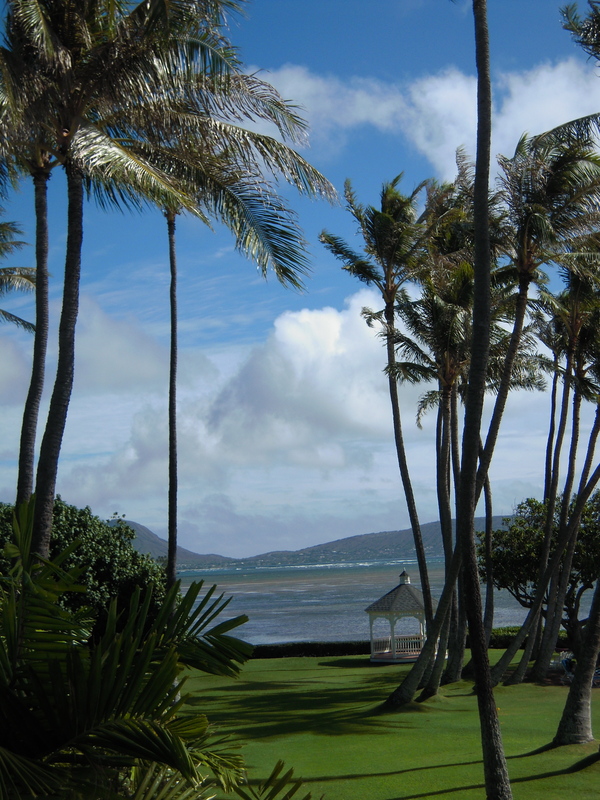 It’s about a 20-min drive from Honolulu but totally worth it. 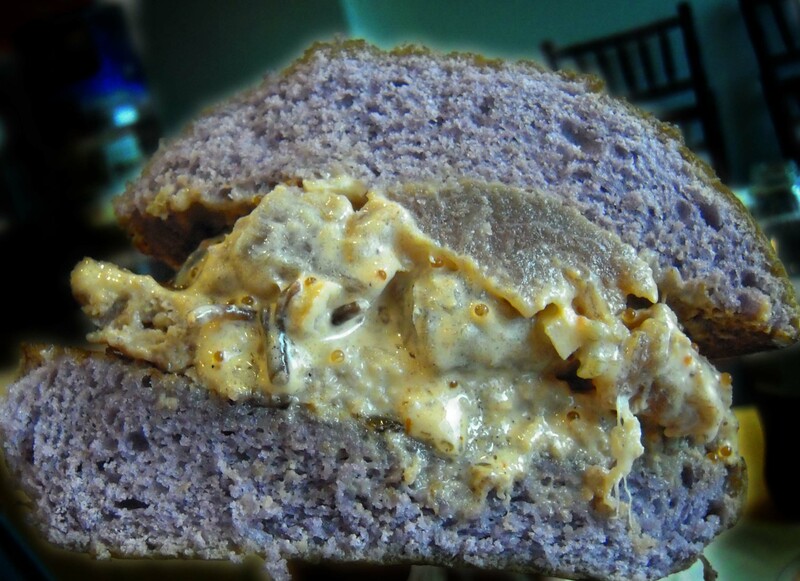 We got a 1/4 pound each of 4 different types of poke (which is an appetizer made with cubed raw fish mixed with spices or soy sauce), then decided we were still hungry and went for the OMG Burger, made with a beef patty topped with creamy spicy ahi poke on a taro root bun (that’s why it’s purple). GASP! The photo doesn’t do it justice, but it was to-die-for. So much so we went back two days later and had another one . . . 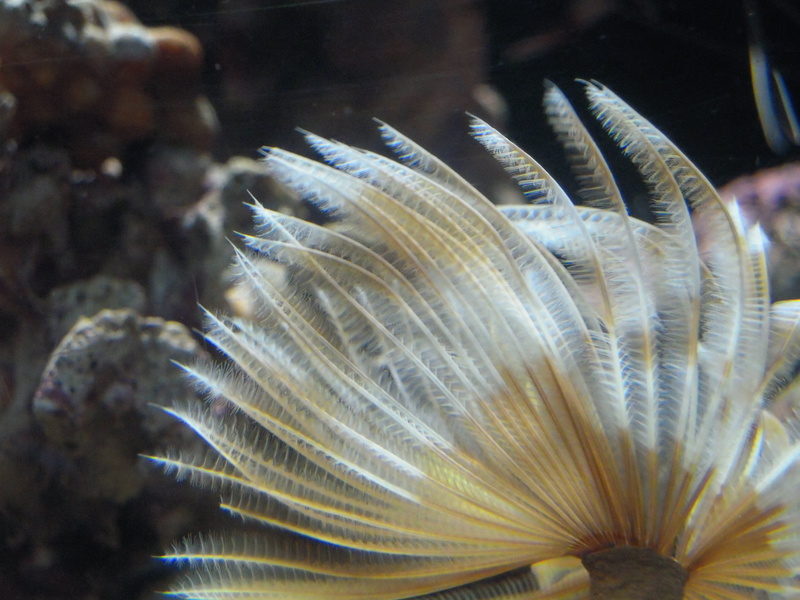 Speaking of fish, let’s talk sushi! 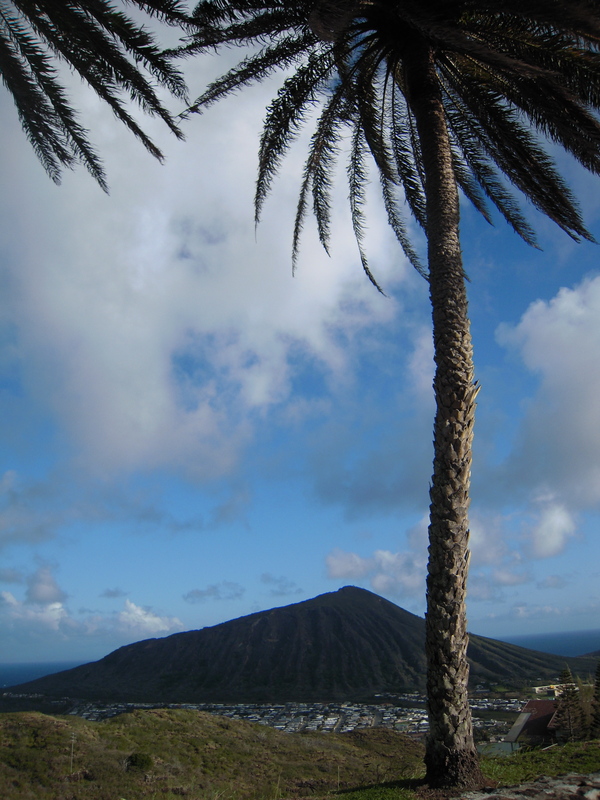 No better place than the islands – ok, maybe Japan? 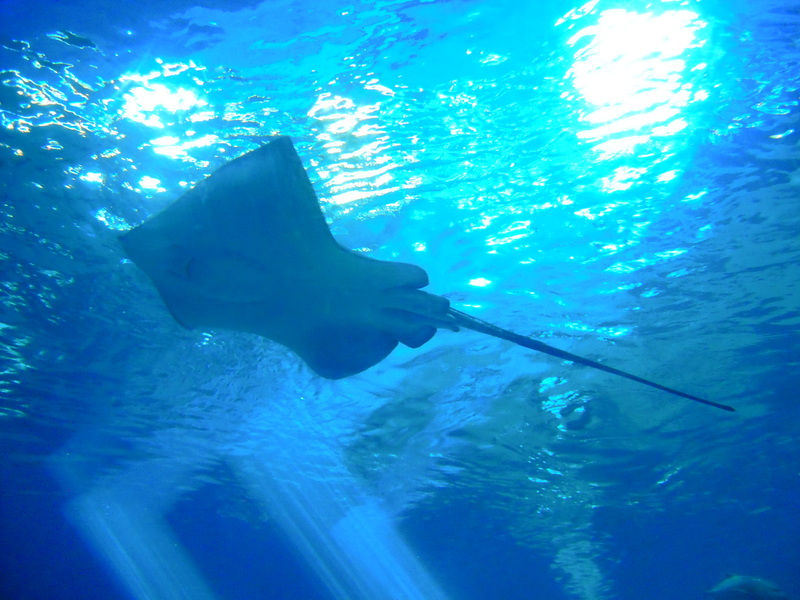 – to get fresh fresh fish! Here are some of our faves. 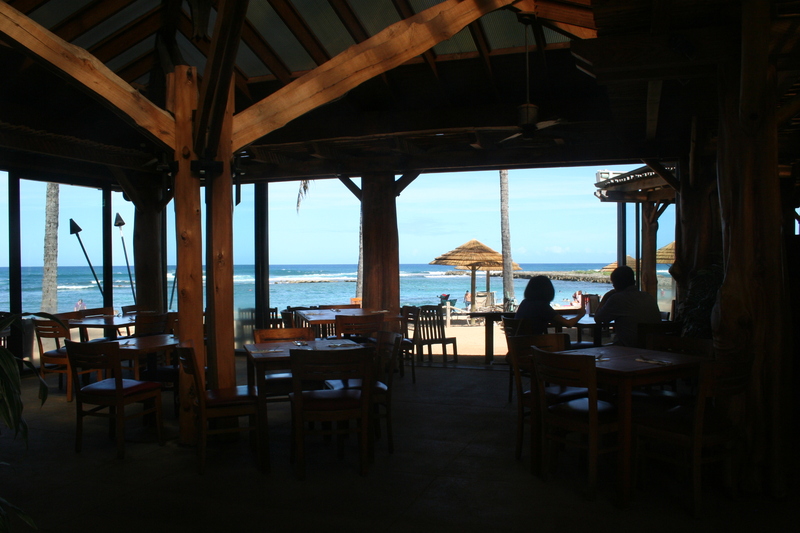 In Honolulu, CALIFORNIA BEACH ROCK N’ SUSHI, is one of those place where you can’t seem to eat enough. It was there we first had hamachi sashimi with chilis and ponzu sauce, that was 10 years ago, and now that dish is everywhere. 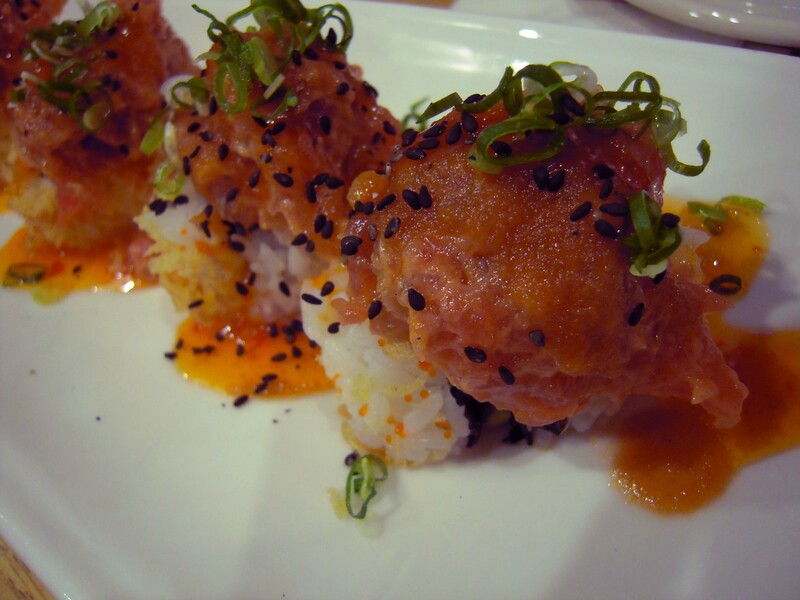 We tried a new roll this past visit called a Tamanaha Roll, crunchy crab roll topped with their spicy tuna tartare mix. 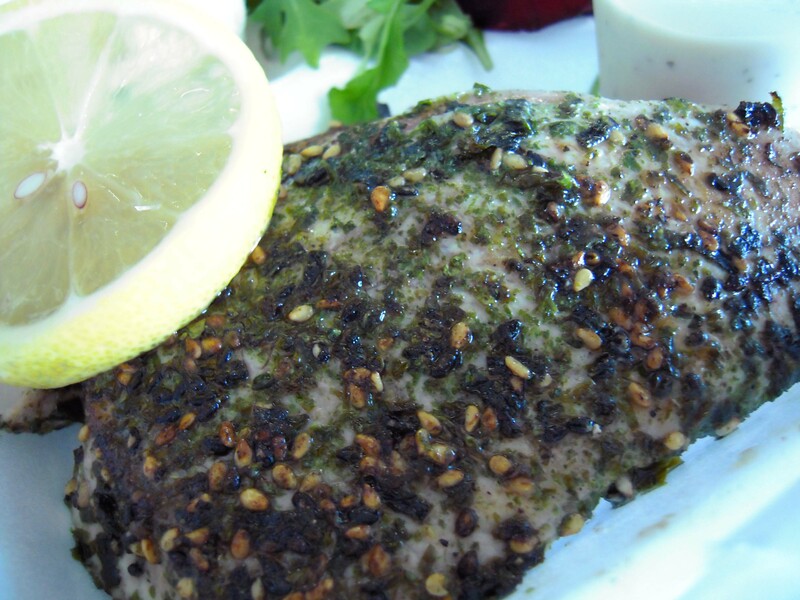 We tried out a new restaurant called UNCLE’S FISH MARKET & GRILL. Well, ok, this one IS Zagat rated and we loved it so much, we went there twice! 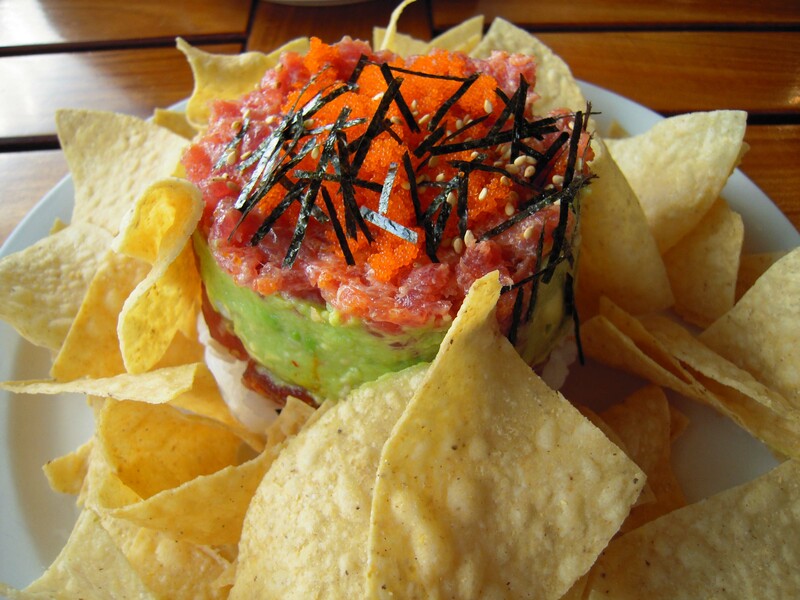 They are known for their Poke Tower which is kind of like a layered dip, but with poke, avocado and rice. So pretty! If you want a more normal poke experience, try their Uncle’s Special Poke with cubed ahi in a rice ‘bowl’. In the same area as Uncle’s is our second “Guy Fieri” stop. It’s called Nico’s At Pier 38 and there is always a line! It’s a plate lunch restaurant which means you get amazing food in a to-go carton and you’re hoping someone will get up so you can snag a table before your growling stomach becomes too much to bear. They were constructing a new building when we were there so I’m sure they’ve expanded by now. 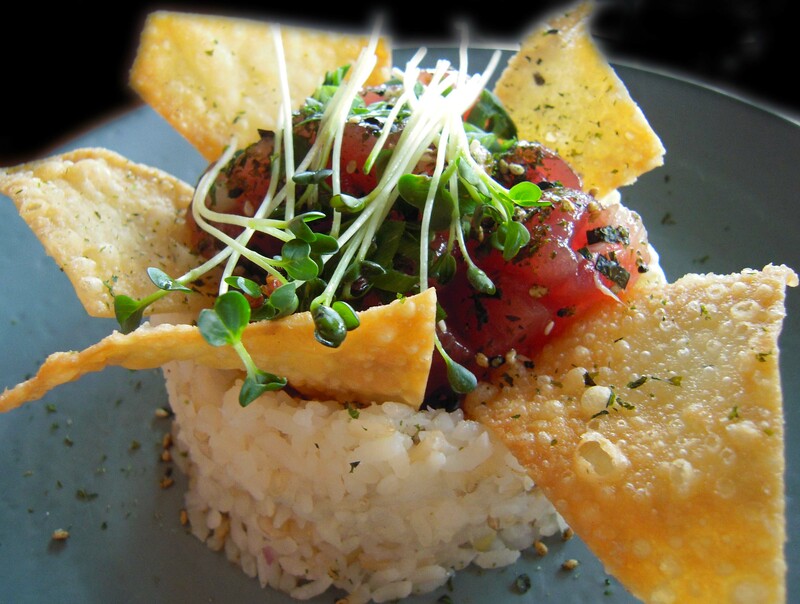 This was one of their specials, Ahi Furikake, a tuna steak cooked with herbs, spices and sesame seeds. I have to end the seafood portion with probably the most amazing dish on the island. I know that is saying a lot, but we LOVE this dish and it was one of the first places my now-husband took me to when we first started dating. GIOVANNI’S SHRIMP TRUCK in Haleiwa is one of the places you probably look at and think “Ew, why would anyone eat there?” then you would see the crowd of people waiting to order, the crowd already eating and the gala of cars parked every which way around the truck. 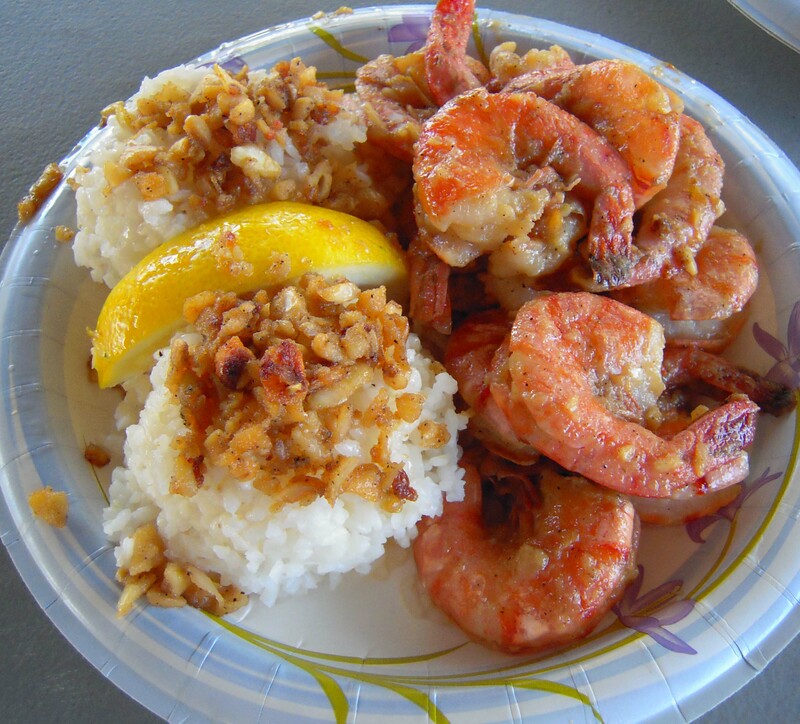 Their most famous dish is their Shrimp Scampi – a dozen huge shell-on shrimp cooked in garlic-y sauce, accompanied by two scoops of rice topped with crunchy fried garlic bits. I have some desserts to post but am thinking that will be another day. . . Enjoy! Aloha All! It’s been about half a year since we’ve last been on the Islands and of course I’m homesick. . . again. 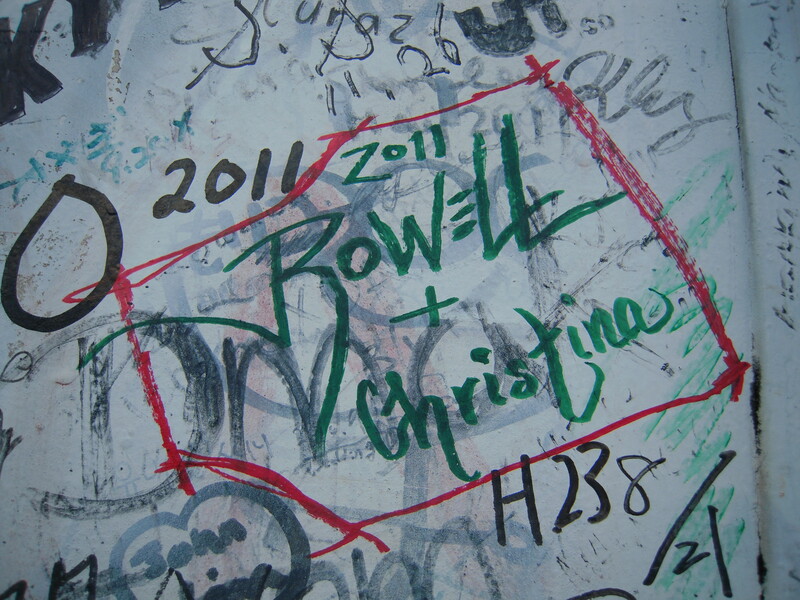 I thought I’d share some more photos from the last trip to try to quell the homesickness. 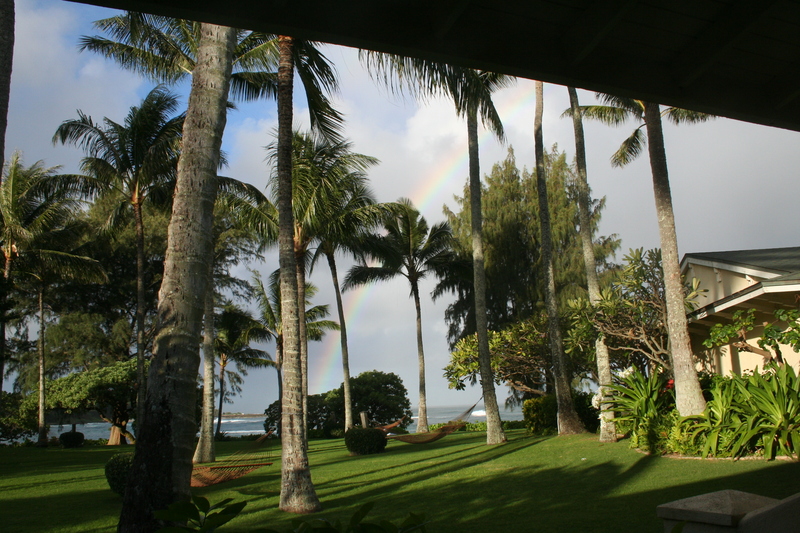 i just love Hawaii . . .